LOS ANGELES - 29 year old Marat Safin of Russia was the featured match against Robbie Ginepri (USA) last night at the LA Tennis Open. Safin appeared to frustrate Ginepri to a 3-6, 6-3, 6-4 first round win. At first, Ginepri had all the answers. He responded to everything Safin threw at him. Ginepri took the first set comfortably. 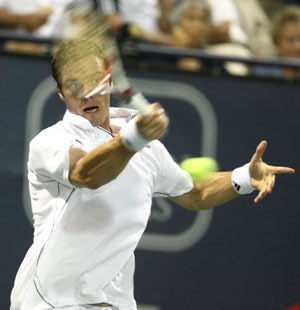 Safin's inconsistency offered many opportunities for Ginepri to take over the match. In the second set, with Safin leading 3-0, Marat double faulted three times to lose a game and then blew an overhead sitter for another game. There was a moment when Ginepri hit a cross-court backhand slice winner just out of Safin's reach and it seemed he might possibly come back when Safin slammed the door shut. Safin was once ranked No. 1 in the world in 2000. He recently announced 2009 would be his last year on the tour. He holds a Grand Slam title at the 2000 US Open defeating Pete Sampras and the 2005 Australian Open beating Lleyton Hewitt. Safin, seeded eighth, plays Ernests Gulbus (LAT) on Wednesday. The second night match featured American Sam Querrey. He wasted no time as he crushed Denis Istomin (UZB) 6-2, 6-0 in front of hometown fans and family. He was a finalist in Indianapolis last week and is in second place on the Olympus US Open Series. 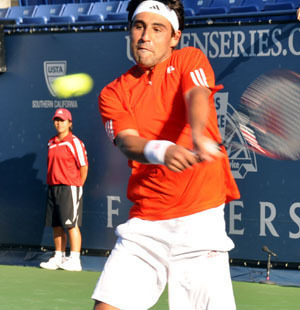 Earlier in the day, a crowd favorite, Marcos Baghdatis of Cypress managed a win against Frank Dancevic of Canada 7-6, 6-3. He will face American John Isner who squeaked by Benjamin Becker (GER) 7-6, 7-6. In one of the best matches of the day 22 year old qualifier Ryan Sweeting (USA) defeated fellow American Taylor Dent 6-4, 2-6, 6-3. They exchanged powerful ground strokes throughout the match. Sweeting was able to take advantage as Dent appeared slightly sluggish as the match ended. On Wednesday, Legends singles is scheduled to start not before 5:00 and will feature Jim Courier vs Stefan Edberg. The top seeds will headline the night play. Bob and Mike Bryan start the evening matches followed by singles. 31 year old Tommy Haas of Germany will play wild card entry Jesse Levine (USA). Haas last won this tournament in 2006. Levine is 21 years old and best known for defeating Marat Safin at Wimbledon last month.